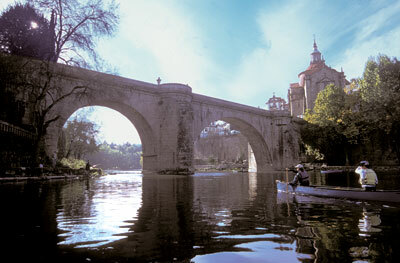 One of our most successful European exploratories (first run in 2003), this trip provides a unique opportunity to be among the first to paddle the rivers of Portugal’s most remote and unspoiled regions. Northern Portugal: “Rivers of the Minho & Tras os Montes” is a sampling of Portugal’s best wild rivers utilizing an inn to inn format. Despite the beauty and suitability of many of these rivers, Portugal surprisingly still remains a frontier of European river running. Northern Portugal’s far northeastern corner Trais Os Montes (“Beyond the Mountains”) is a wild rugged mountainous land -seldom touristed - where rustic towns and villages retain the medieval character of centuries past. It is traversed by the Rio Duoro, northern Portugal’s major river system, which then flows westward through the lush and verdant Minho region - tucked under the hem of Spanish Galacia in Portugal’s northwest corner - ultimately reaching the sea at the famed coastal city of Porto. 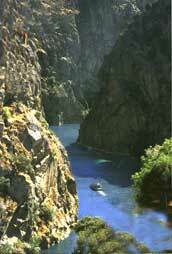 Starting with the uppermost canyons of the Rio Duoro, our party traces that riverine route. The dramatic gorges and remote canyon access of the rivers such as the Rio Sabor and Rio Tua (class I-II rapids, some Class III,) typify the northeast, while vineyard laden terraced hills, ancient cedar and chestnut forests, and pastoral villages and valleys characterize the scenery of the Rios Rabacal and Tamega (both Class I-II) to the west. We stay in a selection of accommodations; small hotels, mountain inns, and even a medieval pousada or two. Local traditional inns, cafes, and taverns throughout all of northern Portugal serve wonderful Portuguese food and wines. Our trip begins and ends in Porto - famed for it’s production of port wine. Its labyrinth of steep streets, decorative tile work, wrought iron balconies, and intricate gardens are reason enough to visit. 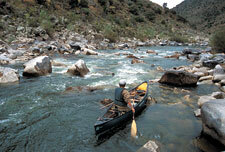 Both tandem and solo whitewater boats are available.